Forum Index > Off-topic Talk > Museum Pics Request Thread, Jr.
Posted: Thu 17 Jul, 2008 2:14 am Post subject: Museum Pics Request Thread, Jr. Some time ago someone had the ingenious and generous idea to allow people here to request pics from museums he was going to. Well, I'll very probably be going to the Musée de l'Armée in Paris next week, and I just thought I'd copy the idea. I know it's nowhere near as interesting as the original thread, because back then many museums were to be visited, but there are quite a lot of things in the Musée de l'Armée, and, this forum's demographic being mainly North American, I figured that maybe someone would be interested, and have a specific request I could be able to help him with. At any rate, I'll be sure to shoot around the whole place and upload the good pics on the corresponding photo album here, because 10 pics really do not even begin to cover the huge and varied collection of this museum. So, if I can be useful, please do not hesitate to ask. It can be any request, very general or very particular (e.g. "I'd be interested in photos of ricassos" or "I'd like a picture of helmet no.##### shot from the bottom right"). Especially, if the admins have guidelines for me to better add to the photo album, I'd be glad to hear from them. Hope I'll be able to serve this site and its forum members as they deserve ! Ok, a special request : I was in the Musée de l'Armée 2 weeks ago, but without a camera, and I don't think I'll be able to go there until September. So if you could please take a pic (or even several) of the horseman's hammer they have in one of the displays in the room to the right (the renaissance room or whatever). As far as I can remember it's on the right side of the hall. I'd need details of the head, handle and as many different angles as possible (and I know how crap the light is up there). 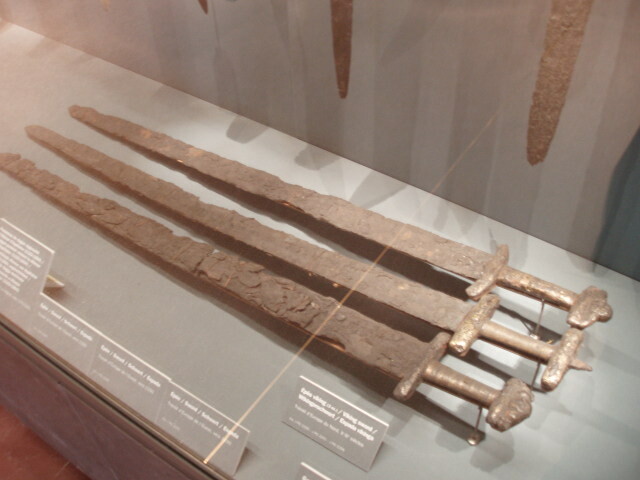 What I really like to see is photos of swords taken from the sides of the cases, if possible, to show how the form appears in side or oblique angles. I am usually amazed at how thin they are and how thick and "chunky" most replicas are, relative to originals, when viewed from the side. I'm afraid they will not have anything Viking. This is a French Army museum ; basically, what's left of the royal armouries of the French kings, kinda like the Tower of London. Apparently, they begin with St. Louis (XIIIth century). However, I'll be sure to try and take swords from unusual angles, if displays allow for it (I'm a bit skeptical about that, but who knows ?). As per Fabrice's cavalry hammer, I'll be sure to put that on my list too ! Well daggers would be nice if they have some early ones and early firearms: Wheelocks, flintlocks, pistols, muskets and even the big wall pieces that look like muskets on steroids. Oh, if they have very early handgonnes and crossbows. Artillery pieces if any are there ? Any would be interesting but the earlier the better ? Well, that is just arms. Armour: brigantines, bascinets, kettle hats ......... well I guess I could just say " EVERYTHING ". The normal angles on stuff but the side shots of things that rarely shown or even the inside or back of things ! Whoa there, Jean ! I'll have to camp inside that museum ! Just kidding. I'll put that on my list. I do like early firearms too. FYI, I will not be able to take pics of anything that's "from Louis XIV to Napoleon III" (mid-XVIIth - late XIXth), because that part is closed. But that hardly qualifies as "early firearms". About "muskets on steroids" (called "pierriers" in French), I remember they do have some, and very impressive ones at that. I'll hunt them down. I know there are mediaeval arty pieces in there. I had a very interesting shot of the inside of a Rhodian bombard, XVth century IIRC. Lost that in a hard drive crash. Will try to make one again. It showed how the thing was not cast in one piece as latter cannons were, but instead made of many "rings" of metal welded together to form a tube. Also, it was impressive how the metal seemed thin as compared to the calibre of that monster ! 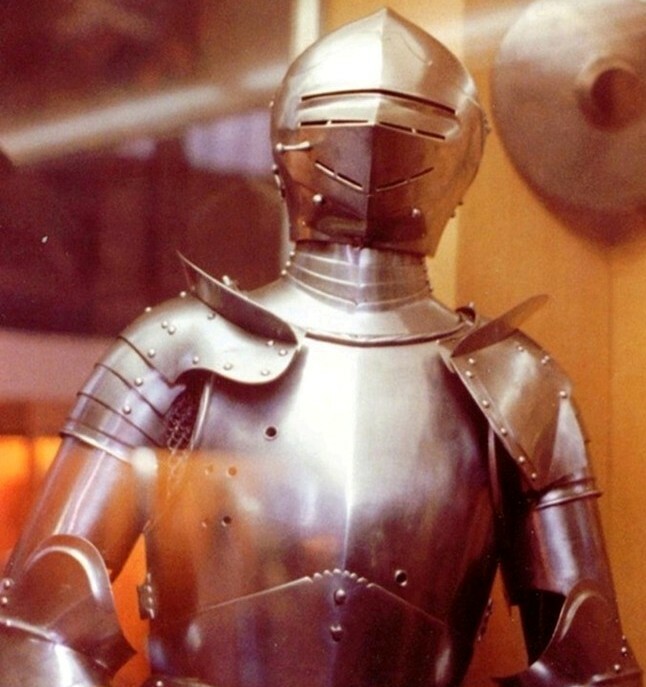 As per armours, someone apparently took quite a bunch of pics of late mediaeval armours (Renaissance) - they're in the "user-submitted museum photos" album (looks like this one needs a serious sorting and cleanup !). So I'll not concentrate on these. I'll be sure to check on earlier armour, though. I'll also be sure to try and shoot at "unusual angles". It shall be an interesting photographic and historical experience ! Duly noted. Any particular details you would like ? I'm afraid they will not have anything Viking. This is a French Army museum ; basically, what's left of the royal armouries of the French kings, kinda like the Tower of London. Apparently, they begin with St. Louis (XIIIth century). 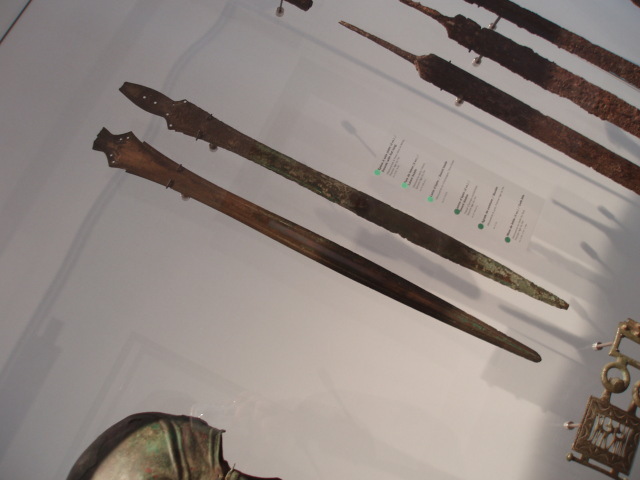 There are some viking swords in this museum; see the attached picture, I hope you'll be able to do better There is also a room for even earlier stuff, including bronze swords as in the second picture. The earlier stuff is curently removed. The viking swords are really great, but they're in one of the sh*ttiest shelves when it comes to lighting conditions. They don't mind the use of flash, but you'll see nothing but the reflection of your flashlight in the glass. Been there, trust me. Don't trust your camera's autofocus, better shift to manual for this visit, also. As I haven't seen any tripods in, I couldn't tell if they are allowed, or if simply no one has tried so far. A tripod might help on this last problem, but I've read about several museums where this is not allowed (the Louvre I think?). Maybe a bit cumbersome to move around too. I considered buying a monopod at one point, there seems to be an exploitable confusion as to whether it is allowed or not... I don't know how practical it is or how much it helps, though. Even without flash the glass is problematic because it reflects the rest of the room... Last time I had to ask a friend to stand at the right place to mask a window reflecting just over the sword. Hello, Simon, the helm especially, and then the rolled edges on the armpits, the backplate, gauntlets, leg harness... This armour has certain affinities with some armours illustrated in the Thun Sketchbook, and I'm trying to figure out how strong the connection is. All requests have been noted, listed and a list has been printed. I will try to satisfy you all as best I can. If there are any more requests, you can still post them, but I am not sure if I will see them in time (I will probably go there on tuesday evening). See you in a week for the results ! If you could take pics of the Falchion with the edge on the "wrong" side from as many angles as possible I would appreciate it. P.S. If it helps, it has a bronze or gilded pommel. it's been well over a week ! Sorry everyone, I have bad news. Due to a lack of informations on the museum's website, I was unable to visit the "Arms & Armour" (that is, the mediaeval) section... I was going there with friends and we wanted to visit the museum on tuesday evening - according to the museum's website, it is open from 17:30 to 21:00. What they do not say on the website is that only part of the museum is open - that part changes every week and, as luck would have it, we arrived to find only the less interesting parts (Napoleon's tomb and de Gaulle's memorial) open. It was a big disappointment for us all, and especially for me, as I am twice sorry for not having been able to provide the pics you asked for. All is not lost, however. I'm keeping the list of requests at hand and I will fulfill them next time I go to Paris - which will probably be in october. This museum may be well-supplied, but really, their management is sub-par, and prices are high, too. Sorry to read that, Simon. Though I wouldn't say Nappy's tomb is the least interesting part (I however find Foch's even more impressive).